Liquids and electronics don't seem to mix - ask all those who have spilt coffee on their keyboards. But that's because coffee isn't a liquid with the right properties. Iceotope, a UK-based company, has created a system that immerses server blades - literally dunks them - in a special fluid. Not only does this make the cooling system silent, without the whirr of the fan or the hum of the AC, the company says it reduces the power load of energy-hogging data centres by half. 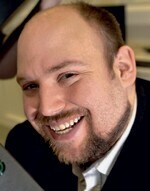 Peter Hopton was an electronics engineer at the University of Sheffield who, in the mid-2000s, studied the history of liquid cooling in supercomputers. The way those early systems - like the Cray 2 which was nicknamed "Bubbles" - worked, was by pumping a coolant. The liquid used was also less environmentally-friendly. But Hopton thought he could go back to liquid cooling and do one better. 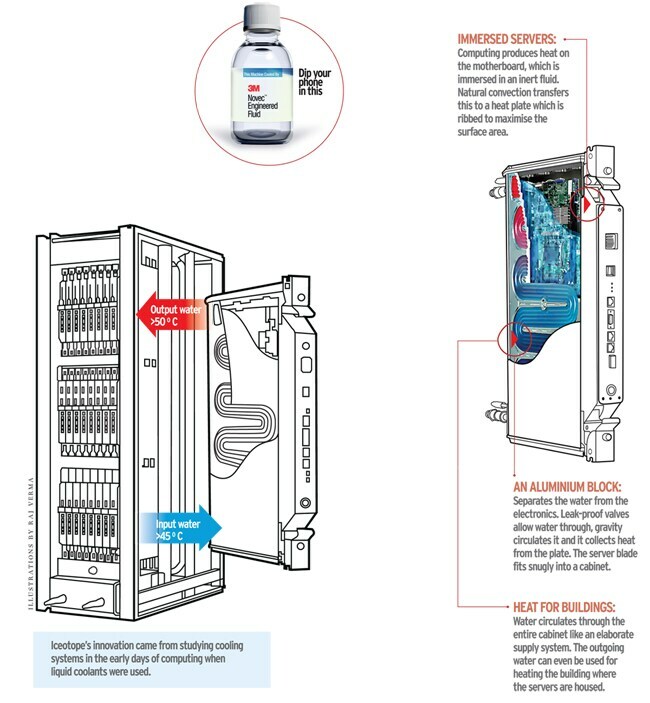 The key component of the Iceotope system is its convective cell, which, without needing a primary pump, transfers heat from the immersed servers to the special fluid and then to water. The water circulates inside a system of internal plumbing and comes out several degrees hotter. This hot water, in turn, can be used to supply heat to buildings where the servers are housed. The engineers tested the cell with 61 different liquids before settling on the 3M Novec 1230 fluid, which is otherwise used in fire extinguishing equipment. The company is now working with another fluid, the Galden, this time from one of its key investors, Solvay, a Belgian chemicals company. Green Revolution uses mineral oil as the immersion fluid, which is considerably cheaper than the 3M Novec fluid, but Hopton says the costs even out over an extended period and the Iceotope system is safer because the fluid used is non-flammable. But Iceotope has Hong-Kong based Allied Control and US-based LiquidCool in the fray which also use dielectric fluids. Hopton's big lesson: Realising how important it is to know one's market. In 2009, Iceotope tried to gain traction in the financial services market and even secured a case study with Credit Suisse. But it soon realised it was the wrong market to pursue: buyers were conservative and used to dealing with big brands, not a brash start-up. "If you don't know your market, it can end up driving the business in the wrong direction," says Hopton. Lesson No.2: Study the IP landscape. Spend three times as much time studying other people's patents as you do writing your own. The common mistake is to go to the patent office the very next day after inventing something, pay money and have the patent pending. Hopton says that is probably the worst way to do it. India is one country on his list, says Hopton, acknowledging there are several data centres here, and it is a high growth market. Schneider Electric, one of its major investors, and already present in India, could become Iceotope's channel to market.